I'm the editor for this YA Fantasy Dystopian. Read for a unique, action-packed Romeo & Juliet story written in beautiful prose. Do you crave adventure? How about a bit of romance? And how about some flying scenes with cute winged guys? Hah! Got your attention didn't I! ?You want excitement? Life or death situations? This is your kind of book! Emerald is a cool kind of chick. She has the misfortune of being born a hybrid but does she let that slow her down? Well, ok at first she does but as she grows she realizes that no. Just because you're a mix of two worlds does not mean you can't do anything to help the horrible world in which you live in! Once she picks up steam you can't stop this girl! Really enjoyed seeing her grow along with Dusk in this book. Things are hard in Centsia, but that doesn't mean she has to crawl under a rock and let everything go by. Like I said, a cool chick, Emerald.Not gonna lie, the beginning was a bit slow and kind of fast all at once. Emerald is wallowing in self pity and then BAM! she meets Dusk and he whisks her away! Handful of chapters in and it starts to pick up! We meet characters that you'll love and some that you won't. There were some parts that became a bit boring that I really wanted to skim over but alas my reader self wouldn't let me. The little bits that weren't though were O.O exciiitttinngg!My favorite parts hands down were the flying scenes. Although they weren't described in excruciating detail as I would've like them to be, I thoroughly enjoyed reading them! I could imagine what Jordan must've had in her head when she describes said scenes though. 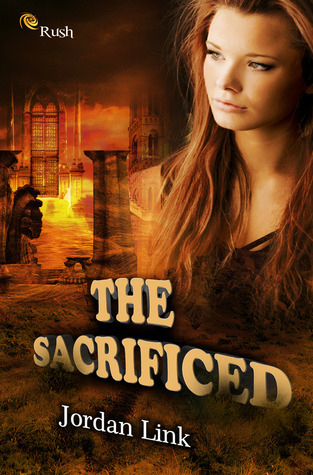 The Sacrificed has everything you're looking for in a book! I am sure you'll like it as much as I did. O.o Maybe even more! Jordan Link - Jordan Link is the author of The Sacrificed, an eBook published by Entranced Publishing in 2013, and the first place winner of the 2012 Jack L. Chalker Young Writers' Contest for her short story "The Bubble." When she's not immersed in the literary world, Jordan enjoys traveling, watching movies, and spending time with friends.